serif of nottingblog: A response to Pasha Malla's "CanLit's Comedy Problem." A response to Pasha Malla's "CanLit's Comedy Problem." There's a wisecrack in everything. Pasha Malla wrote an insightful critique of the Stephen Leacock Medal for Literary Humour in the Literary Review of Canada examining his feeling that this medal rewards anodyne humour which is mostly white and male and is indicative of the received notion of mainstream CanLit's idea of humour in general. Basically, I agree with Pasha about this. I was entirely delighted last year to share the 2017 shortlist with two remarkable writers who I are really brilliant and brilliantly funny: Drew Hayden Taylor and Amy Jones. So the three of us: one Jew, one Indigenous person and one women. Something like one bourbon, one scotch and one beer. You can decide who is which. I was very grateful to have won the award that year. I was touched and honoured. I was glad to see this year’s shortlist comprising three women: Jennifer Craig (Gone to Pot,) Laurie Gelman (Class Mom,) and Scaachi Koul (One Day We’ll All Be Dead and None of This Will Matter). (Jennifer Craig ultimately,won the prize.) However, looking back at winners from years past, I agree with Pasha that historically, the lists were predominantly white and male (and I'd add non-disabled and non-queer) and that the humour was more Horatian than Juvenalian. Gentle satire about the quirks of mostly white Canadians. But I do hope that as its recent long and short lists indicate, that the Leacock medal is moving toward an award which reflects contemporary Canada rather than the narrow world which Leacock himself might have considered. (I found an interview where Drew Hayden Taylor—certainly one of the wittiest and funniest people and writers I know—in a brilliantly ironic and pointed move, quoted Leacock saying that Indigenous people were entirely humourless. That’s just hateful, stupid and entirely wrong.) The very notion of prizes is fraught, but a prize becomes entirely meaningless if it doesn’t notice or reflect its world. 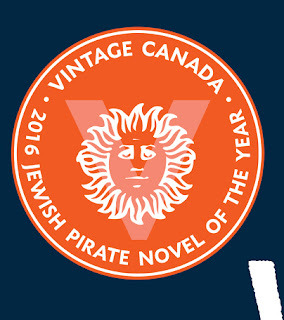 There have been a few aesthetic anomalies among Leacock winners, most recently Gary Barwin’s Yiddish for Pirates (2017), and The Sisters Brothers by Patrick deWitt (2012). These two novels stray from the Leacock formula in some respects—Barwin’s postmodern adventure story is narrated by a Jewish parrot; deWitt’s postmodern Western suggests a Coen brothers/Cormac McCarthy collaboration—but, like Sunshine Sketches, both are situated in worlds so predominantly male that the homosociality borders on parodic. The novels do, in fact, muck with genre and gender conventions, but they still exemplify Leacock’s tendency to centralize masculine nostalgia, here for the swashbuckling and gun-slinging of boyhood fantasies. If I didn’t respect Pasha so much, I wouldn’t respond. But I’d like to say a few things about what I at least hoped to do in the novel. Though there is a range of types of humour in the book, I was most interested in the idea that humour isn’t just a distraction or entertainment but helps with survival both physical and spiritual. I wrote from the belief that humour is one of the great human technologies of survival and of hope. I hoped that much of the humour reflects the optimistic pessimism and pessimistic optimism of Jewish humour specifically. I also intended the humour—the parody and the satire—in the novel to critique, and reveal the prevailing social norms of the day, and to cause the reader to question and interrogate issues relating to colonialism and Indigenous people many of which continue to be important today. Humour can unpack, can discomfit. I hoped for that. What's worse than finding half an worm in your apple. I deliberately parodied tropes and stereotypes — of Jews, heterosexuality and of Indigenous people. For example, Yahima — who says she won’t be anyone’s (even the Jewish pirate’s) “Pocahontawitz”is intended as a parody of the Pocohontas trope: the beautiful Indigenous woman who falls for a European hero. When all the white and/or Jewish men are mired in their colonial capitalistic patriarchical nonsense, she just leaves Moishe (the Jewish pirate) and returns to the sanity of her people. I also hoped to explore PTSD, despair, the horrors of genocide (and racialized murder) and the moral responsibility of witnesses and those who might be complicit. (A Jew escaping pogroms and the Inquisition finds himself witness to the horrors of colonialism. What is his moral responsibility?) I hoped that this did more deep work, and less gentle work than Leacock and the whimsical charms of writers such as Stuart Maclean--though I've always read his turkey cooking story as an allegory about hetcis normativity where the oven is the patriarchy and Dave is an obvious stand-in for Judith Butler. Pasha writes that the book exemplifies “Leacock’s tendency to centralize masculine nostalgia, here for the swashbuckling ... of boyhood fantasies.” I’m not sure I understand this. The entire premise of the novel is that it may be an elaborate yarn told by a possibly immortal gay pirate and includes trauma, genocide, and an ambivalence between storytelling, the responsibility of witness and memory versus forgetting and being free. They search for the Fountain of Youth. Maybe it will allow them to be immortal and continue to be able to bear witness to the genocides they’ve seen. Maybe they will become young again and free from the burden of memory and witness. Also, made as it is from a patchwork of plundered texts and tropes (i.e. the parrot tells the story by borrowing other stories—Treasure Island, Dostoevsky’s Grand Inquisitor, etc.) the very questions of truth, nostalgia and authenticity were meant to be challenged. It’s about being aware that your memories and identity are about the tension between your “authentic” self and a construction made of received tropes. The book was intended to challenge received notions of identity constructed through language and narrative. None of this sounds like nostalgic boyhood fantasies to me. One last thing, Pasha writes that the book takes place in a world “so predominantly male that the homosociality borders on parodic.” When writing the novel, I was extremely aware of the maleness implicit in traditional pirate narratives. Indeed, this was part of my agenda in using pirate narratives and connecting them to patriarchal imperialism and colonialism. I worked to include powerful people who weren’t simply male, white and heterosexual while at the same time parodying some of the heterosexual macho tropes of pirate narratives. My gay African grey parrot “parrots” much of them as he tries to find language to be part of the human world. He spends a lot of time trying to be a swaggering swashbuckling pirate-human and jokes about his testicles. Eventually, he manages to navigate through to a more authentic notion of his own identity. There were some powerful women active in the historical period my novel is set in and they are included in my narrative. I think it wouldn’t be useful to go through all the women that are integral to the narrative. In truth, I hope it is quality and significant not quantity that defines their importance. In writing, Yiddish for Pirates, I did work to try to ensure that women were represented—that I found historical examples—in what could easily have been an entirely male-dominated pirate world as in most pirate narratives. A couple of examples. Doña Gracia is a central part of the Spanish section of the book. She is the merchant responsible for rescuing many Jews from the Inquisition and the events centre around her. She is the matriarch of the resistance. Queen Isabella, while parodied in her role as monarch, is clearly a decisive woman who determines policy according to her own will. Her husband, King Ferdinand is clearly subordinate. I’ve mentioned Yahima, who is an important part of the Carribean sections of the book. She is initially responsible for rescuing her people from a murderous Spanish incursion and eventually joins the pirate crew. I tried to make her act on her own terms as an independent and strong individual. There is also a scene where three Indigenous woman deliberately enact a parody of the classical Sirens in order to attract, capture, and seek revenge on some Spanish men. I hoped by using parody, by satirizing both the male and the colonial gaze, to explore these issues. One more thing: Regarding Jewishness.It's true that Jewishness is often subsumed with "whiteness" and often Jews do and can assume the social privilege of whiteness in the dominant culture, but obviously that's very contingent on the place and time. For example, I'm currently researching the world my grandparents escaped from: Holocaust Lithuania. And Jewish humour--as has been written extensively about—is a distinct manifestation of our culture and social and historical position. Ok. Enough doing what I never do and shouldn’t do. Respond to a review of my work. I did want to make these points about my novel. And I did want to write to also agree with what Pasha Malla wrote regarding what has been considered Canadian literary humour in the past. I am looking forward to seeing the remarkable books that will be recognized by the award (and other awards) in the future. I feel we are at a very fruitful and exciting moment in the opening up of CanLit. There are so many brilliant, exciting and—yes, humorous—books being published in Canada, and books which reflect the great vibrancy of our complex and polyphonic place and time. If you're interested, here's the speech I wrote when I won the award which discussed the importance of humour and the things that it is able to do beyond entertain. Hey Gary, I really appreciate your response here and I apologize if I glossed over some of the more significant and impressive contributions in your very entertaining novel -- which I believe I've told you I enjoyed very much. I should have better articulated that I tend to use "parodic" as a compliment -- I think of my own books as parodies in similar ways that you seem to -- and maybe it didn't come off here that way. At any rate, this is a valuable and thoughtful reply to some slapdash writing on my part. Thanks for it. I surely acquiring more difficulties from each surprisingly more little bit of it, by the way thank for article. if you need PROCUREMENT OF GOODS Sindh then come to us!